11. The decline and revival of Union Square. | Speakers' Corner, Sydney. 11. The decline and revival of Union Square. 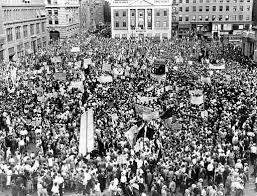 On March 6th 1930, over 35,000 people peacefully rallied in Union Square against unemployment. The rally celebrated International Unemployment Day, a day sponsored by the Soviet Union. It was in effect a protest. When the protestors refused to leave on time, the police cleared the square by force. The attack caused a public outcry against police brutality. 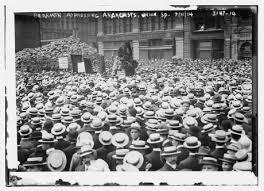 Shortly after the incident, anti-communist Veterans (of World War I) and the ‘Russian White Guard’ wanted to ban radical organisations from speaking in Union square. The Parks’ Commissioner said he couldn’t do that, but supported a voluntary relocation of Speakers’ Corner. Community coalition in Union Square. 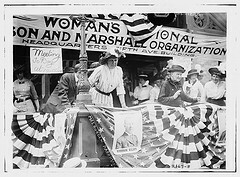 In order to encourage the radicals to leave Union Square, the Veterans organised Patriot Day events to coincide with the workers’ day, May Day. Patriot Day events had motorcycle cavalcades that would harass the radical platform speakers. It seemed a winning combination. But the speakers were more persistent than the motorcyclists, so attempts to stop free speech in Union Square failed, until after World War II when the city’s demography changed. Millions of returned soldiers came home to a new world of prosperity and moved from the city to new suburbs. Democratic rally in Union Square. In 1988 Dr Debra E. Bernhardt (1953 – 2001), a leading labor historian, spearheaded a successful three-year drive to make Union Square a National History Landmark. Her detailed research of labor radicals uncovered the fact that Union Square was the cradle of the eight-hour day movement in the United States. 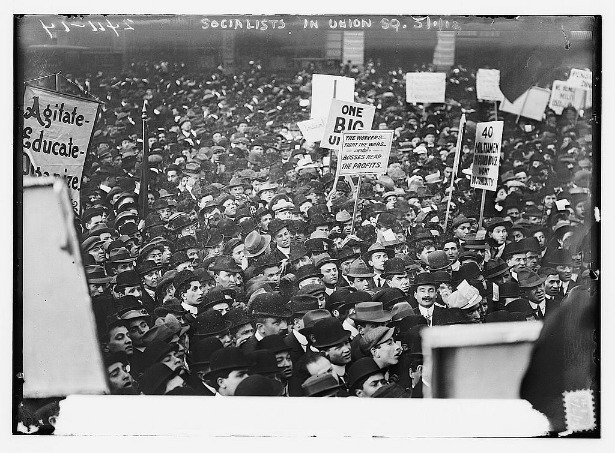 Her findings proved that radical speakers in Union Square rallied the mass support required to win the most basic right of the workers: regulated working hours. In 2009, September 11th (9-11) marked the rebirth of Union Square as a place for political public discussion. Two groups “NY 9-11 Truth Movement” and “No Police State Coalition” would meet at Ground Zero – the site of the former World Trade Center. They asked embarrassing questions about 9-11 and were constantly moved on by police. The two groups revived the Speakers’ Corner in Union Square. The ‘Occupy Wall Street’ protests. Geoffrey Blank, organiser of the Union Square Speak Out, asked for permits which were not granted. He began using a 3 amp “blow horn” (megaphone) in order to be heard above the noisy traffic. He was arrested on hundreds of occasions for using a megaphone without a permit. Nowadays, after long and costly court appearances, Geoffrey Blank lives a quiet life in a New York suburb. He has the satisfaction of receiving the most number of fines for using a “blow horn” without a permit and, more importantly, of having revived the old tradition of radical free speech in Union Square. Protests still continue in Union Square. *Echoes of the Union Square That Was Isidore Wisotsky, Square & Circles, October 1958. **Joshua Frank, the Associated Press. ‘Police Unplug Cindy Sheehan’ Counter punch.